We all know that raising kids entails a big responsibility and most moms have to sacrifice their careers in order to do so. But prioritizing children shouldn’t hinder moms from achieving their dreams such as opening their own business. Mary Grace Dimacili was a stay-at-home mom raising five kids when business opportunity knocked. While most full-time mothers would find it hard to add another ball to juggle, Dimacili found a way to transform her kitchen into a popular string of cafes in the Philippines. Although her husband Hector was capable of providing for the family, the owner of Mary Grace Cafe felt that she needed a creative outlet for herself. When her eldest turned five, Dimacili began selling fruitcakes during Christmas season. Dimacili then saw the opportunity to enhance her gift in creating baked goodies. She then decided to go to the US for a 12-month course on baking. “Stemming from the pleasure of seeing my friends enjoying my fruitcakes and following my heart’s desire to spread joy through my creations, I took a 12 month course on baking in the US to further enhance my budding talent. I came home to harness all I had learned to perfect my own formula for a local delicacy, an Ensaymada with just the right texture and flavor,” Dimacili wrote in her website. She then introduced her ensaymada rolls to the public by first offering it to neighbors, then in bazaars in 1994. In 2001, Dimacili had enough guts to open her first kiosk in Glorietta mall. With its homey personal touch and its signature oven-fresh ensaymada, Mary Grace Cafe attracted neighbours, bazaar friends and a posh new clientele. 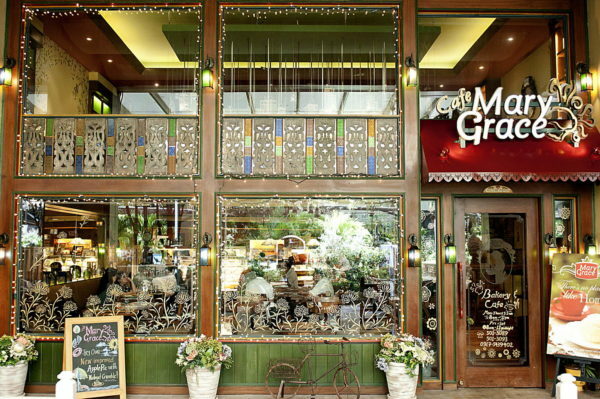 Aside from baked goodies, Mary Grace Cafe is also offering comfort food. “Little did I know [the bazaar regulars] were my evangelizers. While we were developing a loyal clientele, I was also building an emotional connection with people, so that when the first café opened, bang! They knew that Mary Grace was not just a name—they knew that person. They know her voice. They know her commitment to deliver with quality and bring it to your doorstep. So the café became a success,” Dimacili recounted. With over 30 kiosks and cafes all over Metro Manila, Dimacili certainly brought a “home away from home”.